According to Roman Leary's contribution to this anthology, "The Hunting Party," the Masked Rider has a friend who lives at the Carlton Hotel in San Francisco, a reference to Paladin from the radio and television western Have Gun–Will Travel. This reference brings the Rider, who appeared in the pulp magazine The Masked Rider Western from 1934–1953, into the CU. 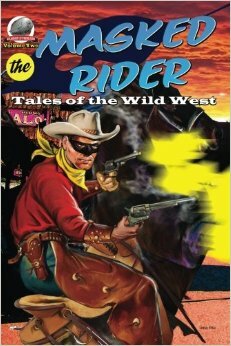 The Masked Rider met Jackson Cole’s Navajo Tom Raine, Arizona Ranger, in C. W. Harrison’s story “Boothill Beller Box” (Exciting Western Volume 8 #2, October 1944), while Raine crossed over with Steve Reese from the pulp Range Riders in “Rawhide Ranger” (Exciting Western Volume 7 #2, April 1944).